This Hawaiian print tote bag is designed with both sides use and rotatable for two different Hawaiian prints, one full size pocket with zipper on the front and one internal full pocket with zipper, double heavy black nylon straps, great for daily basic use, shopping bag, baby diaper bag, travel bag, or great aloha gift to someone special. - Strap drop 12" length with 1.5" width straps. - Tote bag dimension: 20" width X 16" height X 5.5" depth. - Material: External fabric is made from 100% canvas, internal printed fabric is made from random chosen of poly/Cotton. 1)Due to the pattern were cut from random position of the fabric, the print laid out position of each bag is not look exactly same as the photo shown on this page. 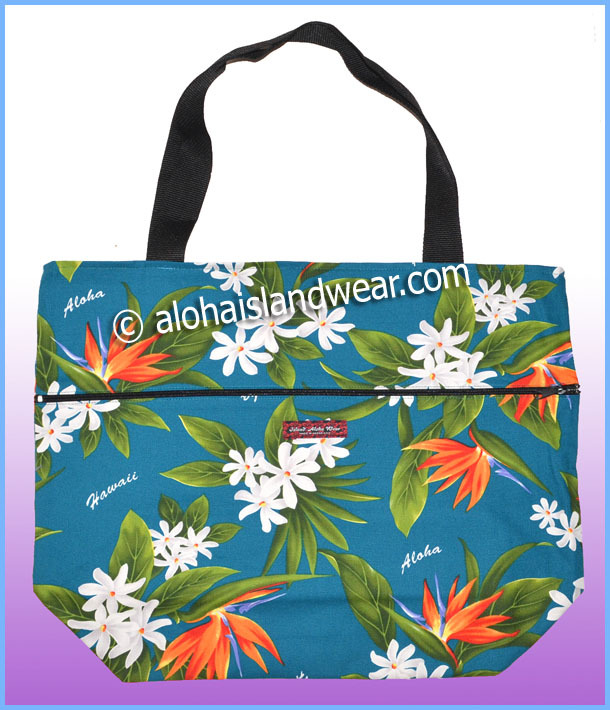 2)The internal Hawaiian print of these reversible tote bags were random chosen from the manufacture, sold as whatever the print available.